From left to right: Yonggang Yao, Liangbing Hu, and Steven D. Lacey of the University of Maryland research team. Credit: Mike Morgan for the University of Maryland. College Park, Md. — Making a giant leap in the 'tiny' field of nanoscience, a multi-institutional team of researchers is the first to create nanoscale particles composed of up to eight distinct elements generally known to be immiscible, or incapable of being mixed or blended together. The blending of multiple, unmixable elements into a unified, homogenous nanostructure, called a high entropy alloy nanoparticle, greatly expands the landscape of nanomaterials—and what we can do with them. This research makes a significant advance on previous efforts that have typically produced nanoparticles limited to only three different elements and to structures that do not mix evenly. Essentially, it is extremely difficult to squeeze and blend different elements into individual particles at the nanoscale. The leading research team, which includes engineers at the University of Maryland, College Park (UMD), published a peer-reviewed paper based on the research featured on the March 30 cover of Science. "Imagine the elements that combine to make nanoparticles as Lego building blocks. If you have only one to three colors and sizes, then you are limited by what combinations you can use and what structures you can assemble," explains Liangbing Hu, associate professor of materials science and engineering at UMD and one of the corresponding authors of the paper. 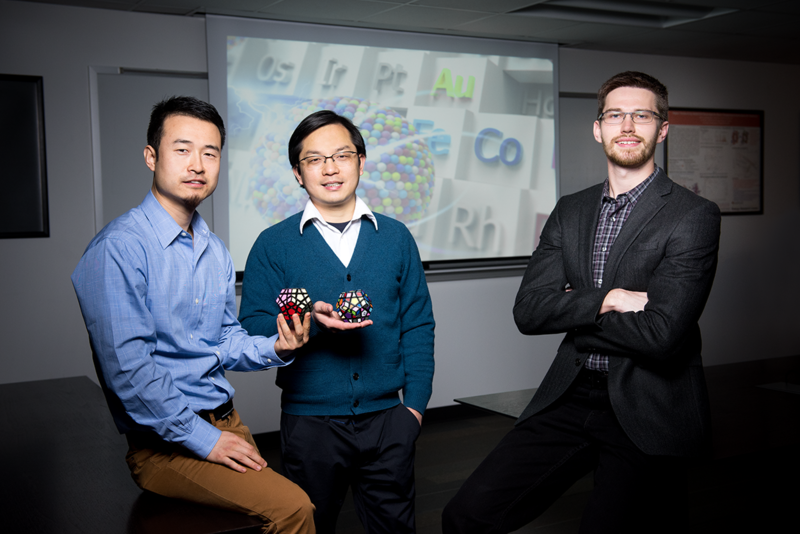 "What our team has done is essentially enlarged the toy chest in nanoparticle synthesis; now, we are able to build nanomaterials with nearly all metallic and semiconductor elements." The researchers say this advance in nanoscience opens vast opportunities for a wide range of applications that includes catalysis (the acceleration of a chemical reaction by a catalyst), energy storage (batteries or supercapacitors), and bio/plasmonic imaging, among others. To create the high entropy alloy nanoparticles, the researchers employed a two-step method of flash heating followed by flash cooling. Metallic elements such as platinum, nickel, iron, cobalt, gold, copper, and others were exposed to a rapid thermal shock of approximately 3,000 degrees Fahrenheit, or about half the temperature of the sun, for 0.055 seconds. The extremely high temperature resulted in uniform mixtures of the multiple elements. The subsequent rapid cooling (more than 100,000 degrees Fahrenheit per second) stabilized the newly mixed elements into the uniform nanomaterial. "Our method is simple, but one that nobody else has applied to the creation of nanoparticles. By using a physical science approach, rather than a traditional chemistry approach, we have achieved something unprecedented," says Yonggang Yao, a Ph.D. student at UMD and one of the lead authors of the paper. To demonstrate one potential use of the nanoparticles, the research team used them as advanced catalysts for ammonia oxidation, which is a key step in the production of nitric acid (a liquid acid that is used in the production of ammonium nitrate for fertilizers, making plastics, and in the manufacturing of dyes). They were able to achieve 100 percent oxidation of ammonia and 99 percent selectivity toward desired products with the high entropy alloy nanoparticles, proving their ability as highly efficient catalysts. Yao says another potential use of the nanoparticles as catalysts could be the generation of chemicals or fuels from carbon dioxide. "The potential applications for high entropy alloy nanoparticles are not limited to the field of catalysis. With cross-discipline curiosity, the demonstrated applications of these particles will become even more widespread," says Steven D. Lacey, a Ph.D. student at UMD and also one of the lead authors of the paper. This research was performed through a multi-institutional collaboration of Prof. Liangbing Hu's group at the University of Maryland, College Park; Prof. Reza Shahbazian-Yassar's group at University of Illinois at Chicago; Prof. Ju Li's group at the Massachusetts Institute of Technology; Prof. Chao Wang's group at Johns Hopkins University; and Prof. Michael Zachariah's group at the University of Maryland, College Park. "This is quite amazing; Dr. Hu creatively came up with this powerful technique, carbo-thermal shock synthesis, to produce high entropy alloys of up to eight different elements in a single nanoparticle. This is indeed unthinkable for bulk materials synthesis. This is yet another beautiful example of nanoscience!," says Peidong Yang, the S.K. and Angela Chan Distinguished Professor of Energy and professor of chemistry at the University of California, Berkeley and member of the American Academy of Arts and Sciences. "This discovery opens many new directions. There are simulation opportunities to understand the electronic structure of the various compositions and phases that are important for the next generation of catalyst design. Also, finding correlations among synthesis routes, composition, and phase structure and performance enables a paradigm shift toward guided synthesis," says George Crabtree, Argonne Distinguished Fellow and director of the Joint Center for Energy Storage Research at Argonne National Laboratory. "Understanding the atomic order and crystalline structure in these multi-element nanoparticles reveals how the synthesis can be tuned to optimize their performance. It would be quite interesting to further explore the underlying atomistic mechanisms of the nucleation and growth of high entropy alloy nanoparticle," says Reza Shahbazian-Yassar, associate professor at the University of Illinois at Chicago and a corresponding author of the paper. "Carbon metabolism drives 'living' metal catalysts that frequently move around, split, or merge, resulting in a nanoparticle size distribution that’s far from the ordinary, and highly tunable," says Ju Li, professor at the Massachusetts Institute of Technology and a corresponding author of the paper. "This method enables new combinations of metals that do not exist in nature and do not otherwise go together. It enables robust tuning of the composition of catalytic materials to optimize the activity, selectivity, and stability, and the application will be very broad in energy conversions and chemical transformations," says Chao Wang, assistant professor of chemical and biomolecular engineering at Johns Hopkins University and one of the study's authors.